Chaparral Biome is characterized as very hot and dry. It is a part of each continent and consists of various types of terrain including mountains and plains. It is sometimes confused with the desert biome but both are totally different. It gets an average rainfall of 10 to 17 inches per year which is way more than the rainfall that Desert biome gets annually. Parts of this biome exist in California, Oregon, Australia and South Africa. The average temperature in the Chaparral Biome is 64°F. This biomeis created when cool water from an ocean merges with a landmass that is at a high temperature. The summers can be very hot and dry here with an average temperature of 100°F and can last up to five months. In summer, due to extremely dry conditions wild fires can break out. The temperature can get as low as 30°F in winter season in the Chaparral Biome. The plants found in this biome include densely-growing evergreen scrub oaks and other drought-resistant shrubs. The most common animals found in this biome are coyotes, mule deer, praying mantis, and ladybugs. Most of them are nocturnal animals which mean they are most active during the night time. The smaller living creatures in the region include the Lady Bug and Praying Mantis. Some plants are highly adaptive to the biome. They will spout only after the dormant seeds have been touched by the fire. Declan, Tobin. " 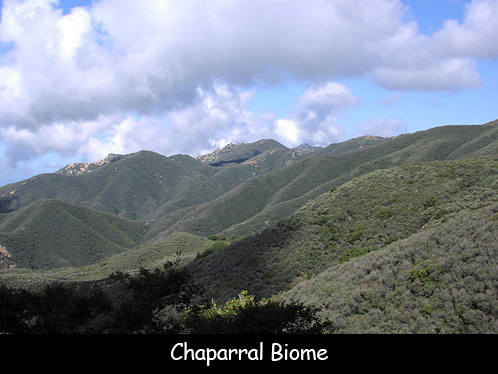 Chaparral Biome Fun Facts for Kids ." Easy Science for Kids, Apr 2019. Web. 23 Apr 2019. < https://easyscienceforkids.com/chaparral-biome/ >.